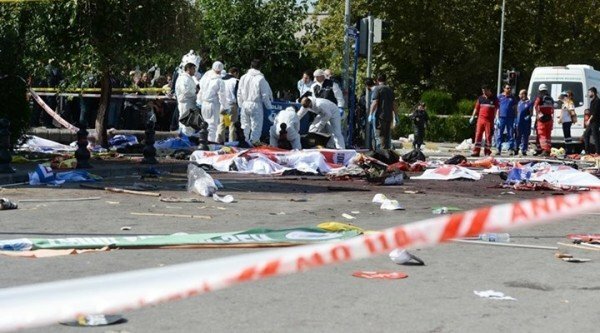 Yunus Emre Alagoz and Omer Deniz Dundar, the two suicide bombers who carried out last week’s attacks in Ankara, are thought to have links to Islamic State (ISIS), Turkish officials have said. Ankara attacks, the worst in Turkey’s modern history that left 97 people dead, triggered widespread anger against the government. Police, intelligence and security chiefs in Ankara have been suspended. The bombers struck as crowds were gathering for a rally against violence between Turkish government forces and the outlawed PKK (Kurdistan Workers Party). According to Turkish officials, Yunus Emre Alagoz was the brother of the man who carried out the bombing in the southern Turkish town of Suruc in July, killing more than 30 people. Omer Deniz Dundar is said to have been in Syria on two occasions. However, PM Ahmet Davutoglu has said ISIS militants may have collaborated with their PKK counterparts. The interior ministry meanwhile has said the move to suspend the police, intelligence and security chiefs would enable a “robust” investigation to go ahead. President Recep Tayyip Erdogan visited the site of the bombing on October 14. He has been criticized for not yet addressing the nation four days on from Turkey’s worst ever attack and a time of national tragedy. Separately, two people have been arrested with alleged links to the PKK for apparently tweeting before the attack that a bombing in Ankara was imminent.